Friday afternoon we explored the woods by the Mt. St. Benedict Cemetery north of Hartford. We encountered many different kinds of sawfly larvae, most of which I couldn’t hope to identify, but I recognized the spiky oak feeder above as a species of Periclista, and a Google search for “black locust sawfly” quickly identified the one below as Nematus tibialis (both Tenthredinidae). 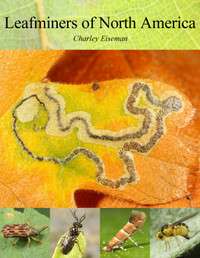 We also found four different leafminers (two moths, one beetle, and one fly) on black locust. I was also able to recognize these black cherry feeders as Sterictiphora (Argidae), based on their distinctive feeding pattern, which I have written about before. …and this tortricid, which seems to be Cydia nigricana—a new state record, but not a particularly exciting one, since it’s an introduced species. On the way back to the cemetery parking lot, we spotted some mines of Parectopa plantaginisella on fleabane (Erigeron), as well as some superficially similar blotch mines on the same plants which backlighting revealed to be the work of Nemorimyza posticata (Agromyzidae). This fly has not been recorded from Erigeron before, but the intricate feeding lines produced by the larvae are characteristic. I have reared adults from several other genera in the aster family that were not previously known to be hosts of N. posticata, so there is no reason to doubt that it uses fleabane as well. Back at the school, all the naturalists gathered in a big room and pored over their finds. Assorted galls, cocoons, and the like were sent my way, including these beautiful cocoons of Hypera rumicis (Curculionidae) on curly dock (Rumex acetosella). …and some equally attractive (but likewise nonnative) fourteen-spotted lady beetles (Coccinellidae: Propylea quatuordecimpunctata). From there we headed to the nearby Hockanum River Linear Trail, where one of the first things we found was a new host record for the leaf-mining beetle Mantura floridana (Chrysomelidae). I’m trying to rear them to confirm the record. In the first photo below you can see three of the bright yellow larvae clustered together inside a leaf; the second photo is a good example of the finely squiggly frass that is sometimes produced by leaf-mining flea beetle larvae. A little further down the trail we found mines of a Bucculatrix angustata larva (Bucculatricidae) in leaves of an aster (Symphyotrichum). Also along that trail, I found this caterpillar mummified by a species of Aleiodes (Braconidae). 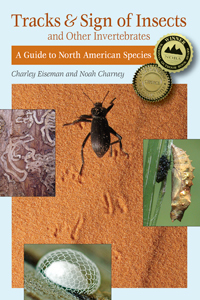 I probably could have identified the wasp to species using this guide to eastern caterpillar mummies, but never got around to it. Right at the end of the trail, Julia spotted bark mines of the elusive Viburnum Marmara. Another new state record, and this one for a native species—but of course the species doesn’t have a name yet. This entry was posted in Uncategorized and tagged 2016 Connecticut State BioBlitz, Agromyzidae, Aleiodes, Amelanchier, Argidae, aster, Asteraceae, bee, beetle, BioBlitz, black cherry, black locust, Braconidae, Bucculatrix, Bucculatrix angustata, caterpillar, Cerambycidae, Ceresa, Coccinellidae, cocoon, Coleoptera, Curculionidae, Curculionoidea, Cydia, Cydia nigricana, Diapheromera femorata, Diapheromeridae, Erigeron, Fabaceae, Fagaceae, flea weevil, Gracillariidae, Hymenoptera, Hypera, Hypera rumicis, lady beetle, larva, leaf mine, leafcutter bee, leafminer, longhorned beetle, Mantura, Mantura floridana, Marmara, Mathildana newmanella, Megachile, Megachilidae, Membracidae, Metriorrhynchomiris dislocatus, Miridae, Nematus, Nematus tibialis, Nemorimyza posticata, northern walkingstick, oak, Oecophoridae, Orchestes, Orchestes pallicornis, parasitism, parasitoid, Periclista, Phasmida, Polygonaceae, Propylea quatuordecimpunctata, Prunus, Prunus serotina, Quercus, Robinia pseudoacacia, Rosaceae, Rumex, Rumex acetosella, sawfly, shadbush, snail, Sterictiphora, Strangalepta abbreviata, Symphyotrichum, Tenthredinidae, Tortricidae, treehopper, Viburnum dentatum, walkingstick, weevil. Bookmark the permalink. Can you help me with this guy my husband Mike found on our maple tree? Thanks and I love reading your blog. Thank you for writing it. Hi Julie–the attachments didn’t come through on the blog. Try sending an email. Well done! You were the two best recruits for the job! I have the feeling that the non-natives may become more common as the countryside heats up. . . .
Those weevil cocoon cages are amazing!